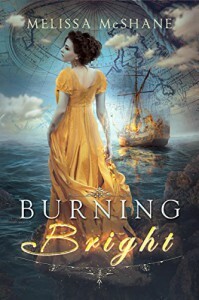 Burning Bright presents an interesting fantastical world in which there are Talents present in a part of the population. These Talents vary wildly between different people and some are Extraordinary, having extra power over their Talent. The Talents are not just a powerful tool but provide status to whoever holds it. The Talents were what I thought made the book interesting. Elinor's Extraordinary Scorcher Talent proves interesting when battling the Pirates in the Caribbean. Her fire-wielding powers are rather complicated even when at first it looks like they are just added to her at will. Some of the other Talents are a bit too convenient if you ask me, but I particularly liked the Bounders. Elinor making the choice to join the navy will not be a surprise for anyone who has read the description. I struggled a little bit with it, as she bounces back and forth from being a lady, very un-Navy like to being -basically- a sailor. Also, as I often experience in this kind of books, everyone is very much in awe of Elinor and all she suggests, almost like there are no other capable characters aboard the Athena. Nevertheless, I thought it was an amusing read, although it did drag a little bit at some points where I was almost ticking of the different things that I was sure where about to happen. Should there be another story in the same Talent world, I would pick it up. Thanks to the publisher for providing me with a free copy of this book in exchange for an honest review!